At Last, Eurozone Culprits Identified! It is Dark Forces, after all. Jean-Claude Juncker, the European Commission president, has finally terminated the endless speculation as to the source of the Eurozone’s travails. In a speech yesterday he has fingered the likely source of any threats to the survival of the common currency subsequent to a Greek exit. Speaking to an audience at the Catholic University of Leuven in Belgium, Jean-Claude Juncker said a “Grexit” would leave the euro prey to forces who “would do everything to try to decompose” what remained of the monetary union. “Grexit is not an option,” said Mr Juncker. His spokeswoman clarified that the reference to the Anglo Saxon world was not aimed at Britain but was to be construed as a reference to ‘markets and speculators’. It should be a great relief to all, especially Greeks, to learn that the Eurozone is an ‘area of solidarity and prosperity’. The news that the dystopia of ‘markets and speculators’ is confined to the Anglo Saxon world is a further comfort. Most importantly if the Great Experiment ends in tears there will be no need for an inquest. It was the Anglo Saxons! Anyone remember Harold Wilson and the Gnomes of Zurich? (1) It fears a transfer of business from the City of London to other financial centres in the Eurozone (including Dublin). (2) As the Scotland referendum showed, the only card that British nationalism has left to play to prevent the Celtic countries seceding is the currency one. A successful Euro means immediate Scottish independence and the end of the U. Kingdom. Period. I am not criticising the UK political/military/financial establishment for doing this. It is perfectly logical from their point of view. If I was Lord JohnTheOptimist, Baron of Sunderland and Duke of Grimsby, with a family history of service in the Royal Guards, the Union Jack tattooed all over my body, and owned a fortune in shares in City of London banks, I would be equally determined to destroy the Euro. Market participants who are so minded will always make money by exploiting the gap between the EU’s political ambitions and the political economy of the institutional and procedural arrangements put in place. Labelling them as Anglo-Saxon may sound pejorative, but it is reasonably accurate since these market participants tend to operate in the trans-Atlantic economic space beyond effective restraint by the EU authorities. There is no reason why Rhineland capitalists, many of whom probably descend from the Angles and the Saxons who refused to migrate to Blighty, have any less incentive to exploit this gap. But they may be a little bit more circumspect about exploiting it. The intertwining of the EU’s political, administrative and economic elites – and the mutual back-scratching it permits and encourages – is bound to impose some restraints. As is typical for the EU, the gap between the political ambitions and the political economy of the institutional and procedural arrangements is being closed slowly after the damaging implications of this gap have been explosed – and, as always, in a rolling crisis context. Damning the Euro and the EMU because it was established initially without the necessary institutional and precedural underpinnings may be good fun, but it doesn’t get us anywhere. Damning it again because the failed state of Greece was allowed to join – and because a majority of Greece citizens are not prepared to consent to what needs to be done to mend their failed state – is even more futile. It should have been clear to the smaller economies such as Greece, Portugal and Ireland that one shouldn’t cavort where the elephants dance. If things go wrong you will suffer. Finland learned this the hard way in the early 90s – and wasn’t suckered. The smaller east European countries which have joined – Slovenia, Slovakia and the Baltic states – are well aware of the disciplines involved. Ireland and Portugal had to learn the hard way – and Spain and Italy are moving up the learning curve. It would be wonderful now if the next step was to require governments to present their fiscal accounts in terms of income and funds flow statements and balance sheets. Proper distinctions might be drawn between current and capital expenditure and between the funding and financing of investment. It might, wonder of wonders, be possible to explain to the ‘bond vigilantes’ the difference between borrowing to either fund or finance productive investment and what should be temporary counter-cyclical borrowing to close a gap in current receipts and expenditures. It may come as a surprise to Mr Junker to learn that Greece is a democratic state and that ultimately when push comes to shove the people of Greece may be asked to either remain in or out of the Eurozone. Messrs Junker, Draghi et al can do squat about it if the Greeks decide they want out. So making a comment such as “Grexit is not an option,” is profoundly stupid. If the Greeks believe, rightly or wrongly they are better outside the union then no amount of bluster or fanfare will matter. As an aside – there is a serious mis understanding that a Greece free from the Troika debt burden (if she decides to walk) will suffer greatly if she tries to borrow in Drachma II. Greece will find it easy – the aforementioned Anglo Saxons will be more than willing to lend to country with no euro debt burden with an economy cheapened by a likely massively undervalued currency at least in its formative stages. Never underestimate the prospect of the Politicos calling it wrong. That the Brits stick pins in a euro doll is patently obvious, just read the FT. To the reasons cited by JtO I will add a couple of others. Basically they don’t like the EU project, never did, after all who won the War? An EZ meltdown would be a re-establishment of the proper order so far as they were concerned. Having decided not to join, naturally they are very keen to be vindicated. Whilst the popular wisdom is that they have indeed been fully vindicated Andy Capp is obviously not aware that the “pound in his pocket” ( I remember Wilson alright, that’s the guy that caved in to Loyalist bully boys) buys less euro today than it did at its inception. A magnificent first for John the Optimist – the British military have had a hand in the Eurozone’s woes! Nobody else, not a single soul, has spotted this. It really pays to pay attention. Back in 2010 it seemed that some degree of acridoidean immersion was a pre-condition for being able to work out, and acknowledge, that Greek public debt, almost certainly, could not be sustained. In EuroPoliticsLand “Anglo-Saxon” is code for short-sellers and hedgies, and it was all their fault. C’mon Colm, surely without paying too much attention you have spotted an underlying malice in the British establishment against all things EU. If you read your FT, and I suspect you might be a closet reader, you must surely have spotted the schadenfreude with which they herald every crisis (imagined or real) of the euro project. And yes the British military is a key element of their establishment, folk from the six counties can testify to that. There is an article in the online FT reporting that last night the Greek parliament passed a statute to hire back 13,000 civil servants earlier made redundant as an integral part of the Troika package. Colm, as one Anglo-Saxon to another, is it time to short the Greek euro and long the Swiss franc? Can the centre hold much longer? I do not have good handle on the politics of this, but it sounds like Grexit just got closer? “He said the design of the monetary union in 1988 was incomplete, the EU rescue funds were not in place as the founding fathers did not believe a euro zone member would lose market access. I wouldn’t blame les rosbifs myself. Bureaucracies find it so hard to introspect. Magnitudes and endlessness. One line of inquiry [at the ECB one allegedly assume aims to understand the Higgs boson by measuring the particle to an extreme level of precision. It is not yet clear whether the Higgs boson is a singular entity, or one of a family of Higgses. If more than one type of Higgs boson is found, scientists will be buoyed up by the thought that a theory called supersymmetry might be right. The theory postulates a heavy invisible twin for every particle type known today. If you can somehow manage to converse logically for ten minutes, Seven_of_9 might introduce you to ‘your heavy invisible twin’ on the Holodeck! The wonders of A Title! There is a lot of structural dysfunction in the system the FT is very reluctant to discuss. I didn’t use the term ‘British military’. You are indulging in ridiculous simplification of my argument. Do you agree or disagree that this is the case? As for UK military involvement, after the dirty tricks MI5 played (link below) in Scotland’s referendum, it is naive to think that they remain aloof from sabotaging political developments that the UK establishment view as being against the (British) national interest. I don’t blame them for that. Its what they are paid to do. However, I am in a charitable mood and have no desire to rub it in, tonight of all nights. Given that the next 48 hours will see the total destruction of political unionism in Scotland, and supporters of The Union throughout these islands, not least in Dublin 4, being brought to stark realisation of the inevitable collapse of The Union within a very short time, I realise that the next few days will be very traumatic for you. I have no wish to make them even more unbearable. On a happier note, and leaving the unpleasantness of the above posts behind, Ireland’s manufacturing production was a staggering 45.4 per cent higher in March 2015 than in March 2014 (link below). This is the real volume increase. This must be getting on for a world record. The next GDP growth figures are going to be ginormous. Even allowing for the claim by some economists that mass production of viagra has artificially stiffened up the CSO figures, production in traditional industry (mostly Irish-owned) was 18.9 per cent higher in volume in March 2015 than in March 2014. Returning to the theme of the thread, this rather renders absurd the claims of some that membership of the Euro has caused a loss of competitiveness in Ireland. The reality is that Ireland has never been more competitive, the last few years having seen Ireland with the lowest inflation in the EU AND (more recently) this has been accentuated by the fall in the Euro against the £sterling. In contrast, manufacturing industry in Northern Ireland is struggling (as indicated by recent weak PMI figures) with the burden of high UK inflation over the past few years AND (more recently) the rise in the value of the £sterling against the Euro. The rise in the value of the £sterling is, of course, driven by the booming financial sector in London and South-East England. The interests of peripheral regions like Northern Ireland are not taken into account at all when traders drive these types of currency movements. It was to reduce the malign effects of volatile currency movements that the Eurozone was created. While the Republic of Ireland is now reaping the benefit (as evidenced by today’s spectacular manufacturing output figures) Northern Ireland is suffering from being outside the Eurozone, as its currency is driven upwards for reasons totally unrelated to the health of its industrial sector. Juncker’s comment was OTT. One must assume that it was designed to convince those that think an exit by any country from an “irreversible” currency union is without risk are fooling themselves. Both CMcC and JTO should aim for the real target. To quote Dean Acheson, “the UK has lost an Empire and has yet to find a role”. He said that in 1962! The euro is just a currency. Nobody assumes that the dollar is dictating US policy. Neither is the euro directing European policy (making the – large – assumption that both entities actually have discrete and coherent policies). Currencies are simply an instrument. Some other links of interest. By the time the UK does find a role, it seems it may no longer exist! Brilliantly succinct. This is your opening response to a piece that shows Juncker to be patently idiotic to the point of being embarrassing. I think it sums up your own credibility on these threads. As I said, brilliantly and succinctly! Where exactly has Juncker said in the parts quoted by CMcC that “Anlo-Saxons are the source of the Eurozone’s travails”? CMcC is putting words in his mouth. It is well-recognised by almost all that some countries have brought their travails on themselves by lax policies. In these quotes at least, Juncker isn’t blaming anyone for the Euro’s travails. He’s simply saying that, if Greece exits, there will be a push to bring down the whole Euro project. This is so obvious that it is hardly worth repeating. Does anyone seriously think, if Greece exited, UK-based financial traders, media and (British) nationalist politicians would not make an all-out effort to kill off the Euro. Whether they’d succeed or not is debatable, but they’d certainly have a go. Thanks for the post Colm. In one way I agree with Junker — Grexit would mean that when some country steps on a banana skin at some unforeseeable moment in the future, markets would no longer believe assurances that it could not possibly leave the Euro, and this could lead to a self-fulfilling run on the country and its banking system. But the language was appalling. A. It misunderstands the way that markets work; they don’t have a political agenda, but seek to maximise profits/minimise losses. B. It is anti-European to demonise speakers of a particular language. The Brits and ourselves (we count as Anglo-Saxons in French-speaking countries) are Europeans too. C. A lot of those “Anglo-Saxon” traders in London and elsewhere are French. D. There is an old and inglorious tradition of continental politicians attacking “Anglo-American liberalism” and the like. It was a particularly popular theme in the early 20th century. The basic problem is that when the UK lost an Empire it lost the entire raison d’être for its existence and made its eventual dissolution inevitable. Hopefully, the Scots will put another nail in its coffin today. This has nothing with Anglophobia. All the countries in these islands will prosper much more when the political entity known as the U. Kingdom disappears. Most sensible English agree with this line of thought now, and will eagerly welcome being allowed to run their own country. The term “Anglo-Saxon” in use on the Continent has nothing much to do with nationality. It is a straightforward reference to Wall Street and its outrigger – and increasingly poorer cousin – the City of London and to their Wild West financial practices which are viewed, with considerable justification, as the main trigger of the global financial crisis. By the way, does anyone remember Nicholas Ridley who described the proposed Economic and Monetary Union as “a German racket designed to take over the whole of Europe”. Surely this blog will provide ample fodder for a sociology thesis for some Ph D student. Take the treatment of JtO. He has been a Prophet of Good News of biblical proportions and yet he has attracted a mean spirited anti-fan club in a sort of reversal of the “shoot the messenger” syndrome. But what really catches the breath is the new found empathy with our closest neighbour with some even claiming Anglo Saxon heritage. The Germans are the new villain of the Irish piece (+ Junker, Trichet, Mario etc.). Poor DeV must be spinning. You could argue that continental disagreement with Anglo American capitalism was one of the main causes of WW2. Lebensraum was about a different growth model. The Germans, Dutch, French etc are as much infected with neoliberalism as the Brits. The logic of debt driven growth took over from Keynesian post ww2 economics in Europe too, you know. It’s just that the Anglos have better institutional arrangements for failing institutions. Or at least had the last time. Those Anglo-Saxon markets in full swing today, with huge rises in euro bond yields across the zone. Some argue that the suite of Basel reforms has resulted in far less liquidity in many markets, another example of unintended consequences. On the UK the interesting thing is that the improvement in the economy ( yes, not as rapid as in previous cycles) has not helped boosted Tory support as one might expect, at least according to the opinion polls (they may be wrong of course).The recent pick up in real wages may have come to late for them. The first past the post system also means national polls can be very misleading- The FT predict that UKIP will get 1 seat despite as 12% poll rating. Kevin O’Rourke: A lot of those “Anglo-Saxon” traders in London and elsewhere are French. I learn from dsquared that “FFM” is a widely-used acronym in the City; the last two letters stand for French Mathematician. The possibility of Grexit looms larger by the day. If it happens, one of the consequences will be to reveal the essential unity of international financial markets. Posturing by the UK will then be revealed for what it is. Especially if it does not have a government to respond. Juncker has, incidentally, lost the run of himself. The only official in Europe that can move markets is Mario Draghi. Now, there is an idea to increase the “pot of money” being spoken of as being called upon to “restore” Irish public sector salaries, including the university sector! Excellent result for the Tories last night, a vindication of the common sense of the Great British public and the sound economic policies of George Osborne. The Tories have absolutely no interest in harming the euro – it gives them a great competitive advantage over their neighbours, and is an open wound for Labour and the LibDems. I think we should use IOUs to pay low-level EU lobbyists. I heard one UK commentator remark that “shy” Conservative voters i.e. those unwilling to reveal their voting intentions publicly might prove to be decisive. He was right! (Shades of a story I quoted some time ago, based on fact, where a candidate who got little or no votes in a local election, when asked by an old lady in the town expected to support him, what lesson he had learned, he replied “that this town is full of liars”). The question for the SNP is “what do we do now?”. At least the UK will have a government. And a referendum on EU membership – not on Scottish devolution – where common sense will also prevail and the UK – still united – will vote yes to a package of “concessions” that the rest of the EU will somehow cobble together. How the UK economy performs in the next few years will be the key in relation to public sentiment. It is on very shaky ground. Well, if they take my advice, they should assemble in Edinburgh this afternoon and declare Scotland independent, to take effect at midnight tonight. Fait accompli. They have a mandate. They have 56 out of 59 seats, which is more than Sinn Fein had in 1919. If they do so, there will be no reaction from London similar to that when Sinn Fein declared independence. In fact, I’d say there’d be universal rejoicing throughout England. Even if they don’t follow my advice immediately, it is clear that the Union is finished. As John Cleese said many years ago in his famous Monty Python dead Union sketch: “This Union is dead; it has popped its clogs; it is finished; it has gone to meet its maker; this Union has f***ing snuffed it”. I predict an SNP landslide in next year’s Holyrood election, a referendum in autumn 2017 and a massive ‘yes’ vote. Even last year, polls showed that a majority would have voted ‘yes’ if they they’d known the Tories would be returned at Westminster. I have nothing against the Tories ruling England (like JF, if I was English, I’d vote for them). But, as Alex Salmond said just now, they have no legitimacy for ruling Scotland. Not sure if the explanation for the polls being wrong is ‘shy Tories’ and people lying to pollsters. It might be, but I’d have thought that would apply to the exit poll as well, which was extremely accurate. As I posted here a fortnight ago, although a nationalist, I voted DUP. A purely tactical vote, in protest at the left-wing economic policies and extreme social liberalism of the nationalist parties. It is obvious I wasn’t the only nationalist to do that. The total nationalist vote in N. Ireland is down 3.6 per cent and the total unionist vote is up 3.8 per cent. The SF bubble has burst. Its vote is down, it has lost Fermanagh-South Tyrone, it has been humiliated in its target seat of North Belfast. The DUP has overtaken it as the largest party, despite every liberal commentator telling us for the past few weeks that the DUP would be hammered because of its illiberal views on social issues. While the SDLP is following the path of Irish Labour and UK Labour into decline and irrelevance. What N. Ireland needs now is the dissolution of SF and the SDLP, and their replacement by a proper sensible nationalist party like the SNP. Bad result for the Tories IMO. Razor thin majority. Cameron to held to ransom by the gonads over Europe by as few as three Europhiles. Scotland just had an independence referendum, they voted no. The UK has never been in better shape – low inflation, low unemployment, an entrepeneurial culture supported by an efficient safety net, and now a smart centre-right Government. While I agree with your overall economic outlook (and congratulations on being one of the few who predicted a Tory victory), I doubt if the UK is enjoying a competitive advantage over Euro countries at current exchange rates. It did for 5 or 6 years up until the recent sharp rise in the value of £sterling. When I was last in my home village in Tyrone at Easter the flow of shoppers was almost entirely in the direction of LetterKenny, Lifford, Ballybofey and Monaghan, the opposite of what it has been since 2007. Tyrone and Fermanagh have the largest border with the Eurozone of any counties in the UK and they are being hard hit by the current exchange rate. I’m surprised that no thread has yet been opened on the UK election. I hope there will be one later. After the Greek election a thread was opened that had about 2 million posts within minutes. Do people seriously think the Greek election was more relevant to Ireland than the UK election? Anyway, one of the most pleasing features of the UK election was the total destruction of the Liberals. Just when liberalism is all the rage among the Dublin 4 media and political elites, the UK electorate dump it in the bin. Makes it all the more daft, therefore, that Michael Martin has enrolled FF in something called the World Federation of Liberalism. Dev must be spinning in his grave. With this sort of leadership, FF will be lucky to beat the UK Liberals’ performance yesterday. A(n) (r)evolutionary 1919 moment in Scotland and a roar from latent English nationalism. Bit of an oul dynamic around in These Islands at the mo! Agree re the LibDems, couldn’t happen to a nicer bunch. The UK election gives us a nice preview of our own next year. Fine Gael will do well. Labour will be destroyed – wouldn’t be surprised if they ended up with around 5 seats. Shinners will get about the same vote share as their soul brothers in UKIP but PR will deliver them seats. FG-FF will be the only show in town whether they like it or not. Speaking of Sterling. Can anyone explain to me, a mere mortal, why with the UK, with its giant trade deficit, narrowly focused economy based on housing and financial services has a currency performing so strongly? All you ever wanted to know about exit polls and were afraid to ask. They are not the same animal as an opinion poll. The “shy” Conservative voter does, it seems, exist. I think that you are misreading the SNP vote. All of Scotland could plump for it precisely because to do so was an entirely safe bet. Nothing would happen. The next opportunity for the Scots to demonstrate how different they are will arise in the context of the UK referendum on membership of the EU. The other capitals must be scratching their heads as to what additional “opt-outs” can be dreamed up for the UK as they already have all that could be imagined e.g. non-membership of the euro, continued control of movement of persons at their borders (with both Ireland’s cooperation and participation), a la carte participation in issues relating to police and judicial cooperation etc. etc. Whatever the others concede, two conditions will have to be met (i) no major treaty change which would require a referendum in France and (ii) some kind of quid pro quo. My bet on the first is that any changes negotiated will fit within the so-called “simplified amendment procedure” in the Lisbon Treaty which does not require more than parliamentary adoption (except maybe in Ireland – see below). On the second, it seems likely that it will involve some form of change to the European Parliament to allow better “democratic” oversight of the ECB by the countries that have adopted the euro. (Trichet mentioned this possibility during his recent daring visit to the enemy capital; from which he escaped without a scratch). On the possibility of a referendum in Ireland, the collective wisdom of the legal eagles in Ireland over the past decades in relation to observing the stipulations of the Irish constitution in relation to the country’s international relations is that the relevant section – following serial amendments – is now a near incomprehensible mess. (I invite anyone who may disagree to look it up!). The safe option has always been the choice of politicians as a result i.e. to put the issue, whatever it is, and whether this is justified or not, to the people. It would be the ultimate irony if the destiny of the UK in the EU was to be decided by the Irish electorate! I do not know whether the UK economy is in good or bad shape but the analyses that I read which correspond with my own observations over the years tells me is that it is more or less the same as it always was (or, at least, since it ceased to be the “workshop of the world”) i.e. an economy highly dependent on the City of London to balance its books. Things are looking good on that front as the negotiations on the relationship between the City and the Continent are already largely concluded. The reference to France should be to any country. The irony of the situation is that the difficulty Cameron has in setting out his stall – for whatever it is he is seeking – is that detailed studies already carried out show that the UK is not at any particular disadvantage. He cannot leave the matter drag on because of the uncertainty this is already causing. At the same time, he must get something substantive to be sure of getting the right result in an unnecessary contest of his own making. Michael Emerson of the CEPR on the topic. That’s very disappointing. I was hoping it would be a lot less. These things go in cycles, herd instinct kicks in, and the correction is overdone. Sterling fell sharply against the Euro from 2000 to 2009. Almost 40 per cent devaluation. This was too much. For a time (2009-2012) prices in UK were the lowest in Western Europe. Northern Ireland became much cheaper for shopping than the Republic. Hence lots of cross-border shopping to Derry (or Londonderry, as the Dublin 4 elites prefer to call it), Strabane and Newry. A correction was due. Again this has been overdone and the UK is now more expensive, exacerbated by high UK inflation post-2007. This doesn’t affect mainland UK much, but it’s definitely now having a significant effect on shopping towns on the N. Ireland side of the border. Sterling will eventually turn, but I’ve no idea when. Cameron’s victory will probably give it another lease of life. But, for how long? I’ve no idea. Could be weeks, months or years. If I could predict it, I’d be off getting rich, rather than posting about it here. Where do these ideas come from I wonder? I remember someone else on this blog commenting that the UK economy would be banjaxed by North Sea oil production declining. The UK has an incredibly broad, diversified economy. The rule of thumb in Ireland should always be – if you think something bad is going to happen to the UK then immediately accept that it’s just wishful thinking and the opposite is almost certainly going to happen. Unless what you are thinking about is the English football team. @ JtO: Suprise, suprise John, but one woman’s wages may (or may not) become another woman’s supply signal. That is, the more non-fiat credit money that enters an economy the greater the probability of an increase in consumer demand. However, should wages/salaries either decline (or remain as they are for an extended time period) demand stagnates (or worse, declines). Wages/salaries have to increase by about 30%! Not possible. The logic of the current high level of personal indebtness in Ireland (mortgage; loans; cars; credit cards, etc) is that some proportion of any increase in wages/salaries may be used to pay down some of the debt – hence of no nett positive benefit to G*P. Interest payments on debt are equally useless – they perform no positive productive purpose. Ireland actually regressed economically – a decade by consensus, though I’d put it nearer to 15 years, so we have an awful lot of ‘recovering’ to do. Is this possible? No! So what is actually happening with our economy? See below. And as for the UK. Sure its economy is a lot bigger than ours. But is it better shape? I doubt it. The US economy is even bigger again. And it sure is in a pretty awful mess. Pulling ourselves up by our own boot laces works fine until one of the laces snaps off. Of course, if those laces are not of leather but are thick bungy strings! The more you pull, the thinner it gets! UKIP, Greens and Libdems got 25% of votes and 10 seats. Tories got 37% and a majority. FPTP is no longer fit for use. I’ll take your word for it on the exit polls. I don’t claim to an expert on them. I didn’t say that the ‘shy Tory’ expianation was wrong, Just that ‘it might be’ correct. I am a bit peeved though at the incompetence of the UK pollsters, as I lost £100 to Paddy Power from bets that I’d never have made if the polls had been halfway accurate. The referendum in Scotland was lost only narrowly, and only because the aged 65 plus generation, brought up during, or in the immediate aftermath of World War 2, with all the British nationalist fervour associated with it, voted overwhelmingly against. In coming years this generation will be dying off and replaced by the younger generation who are much more favourable to the idea of Saor Alba. It gives me no pleasure to say that, as I’ve just reached that age-group myself. One thing they shouldn’t do is all get in the same plane. Apparently, all 56 SNP MPs are going to fly from Edinburgh to London tomorrow in the same plane. A major mistake, possibly. Having lived in Belfast all through The Troubles, and hearing firsthand what recalcitrant elements in the British military establishment (not sanctioned by the government, of course) are capable of, I wouldn’t be at all surprised if there are 56 bye-elections in Scotland next month. No amount of money would get me on that plane. Ireland actually regressed economically – a decade by consensus, though I’d put it nearer to 15 years, so we have an awful lot of ‘recovering’ to do. This is false. GDP/GNP peaked in 2007. It then fell between 2007 and 2011, but only to its 2004 level. Since 2011, GDP/GNP have been growing again and in 2015 both are almost certain to exceed their 2007 level by a considerable margin. A regression of 15 years would have brought the economy back to its mid-1990s level. In fact, GDP/GNP this year will be around double their mid-90s level (that is, in real terms). No doubt you will say that he CSO figures are wrong. If you can supply any reasons why your own GDP/GNP estimates should be preferred to the CSO, estimates, I will give them serious consideration. And as for the UK. Sure its economy is a lot bigger than ours. But is it better shape? I think that, compared with continental Europe, the UK economy is in good shape. The UK electorate (at least in England) seem to agree. Although the Irish economy is now growing faster than the UK economy, the UK recovery started 2 years earlier than in Ireland, and this is reflected in the UK’s very low unemployment rate, which is partly due to its very successful labour market policies. Although the gap has narrowed significantly since 2013 (from 7% to 4.4%), I think it will be 2018 before Ireland’s unemployment rate matches that of the UK. However, I don’t see any sign that the UK’s long-term economic growth will exceed its historic average of around 2.5%. It always runs into balance-of-payments problems which don’t necessarily cause a recession, but keep growth restrained, and I don’t see any sign that this time will be different. While 2.5% average over the long-term is quite good, and certainly better than all but a few continental countries, there is every reason to believe that Ireland’s economic growth in coming years will exceed this by a considerable margin (and nearly al economic forecasters now predict this). … and … and … the humble citizenry, forced to pick up the odious tab, have not received any explanation whatsoever of how … how … these board directors and senior bank management created the greatest financial system fu*k up in history. The most obvious culprit fingered once again! The ECB is, by definition, a politically created body but it cannot take political decisions which are not within its mandate and which are the responsibility of governments. It is, of necessity, a rules-based organisation. The “advice” that it offers cannot be taken lightly. Still less can it be considered feasible politics to demand that it admit that is more than simple advice. This is a lesson which has been meted out to a variety of governments at this stage. How it will end in the case of Greece remains to be seen. Eg this from Martin Wolf in the FT…. Perhaps I would drop the ‘narrowly focused’ and put ‘overly reliant on..’. ‘In reacting to Scottish nationalism the right, in the shape of Conservatives, had a more coherent policy [than Labour], although it often reminded one of the denunciations of Irish Home Rulers. The Conservative Party exploited British voters’ hostility to home rule in the decades before 1914, suggesting that the reliance of Gladstone and Asquith on the votes of Irish MPs was illegitimate and unpatriotic. Cartoons in Tory papers showed clod-hopping Irish peasants manipulating like so many puppets Liberal leaders greedy for power. Realism from a QUB man …. Further confirmation today of Ireland’s growing housing shortage. Ronan Lyons correctly points out that the problem is ‘shortage of supply’. In addition, rents in the provinces are now increasing almost as fast as in Dublin. Annual increase of 8.3% in Dublin v 7.5% in Cork and 7.4% in Galway. So, what happened the 350k empty houses FF were supposed to have left behind? Weren’t we told ad nauseum that the 1995-2007 economic growth was based entirely on building houses that were superfluous to the country’s needs? So, how come there’s a shortage now? Shouldn’t the current government set up a Task Force to try and find them (or at least find out if they ever existed), and thereby relieve pressure in the housing market? How come nobody (apart from myself on here) predicted the current housing shortage? Looks like the ‘350k empty houses’ and ‘tens of thousands of ghost estates’ were yet another media hoax, invented to discredit the 1997-2011 FF Government’s growth record. Rather than the constant denigration of builders and developers, what the economy needs now is to bring them in from the cold and get them building houses on a large-scale again, because their detractors certainly won’t. Market forces will eventually do this anyway, of course, through the usual mechanism of rising prices, higher profits leading to increase activity. The irony and the tragedy is that very little, if anything, has been learned. The various rent-capturing special interest groups will continue to feather their nests at the expense of most citizens and economies until the demographic and political forces emerge that will eliminate this publicly authorised fraud and theft. It’s unlikely to be pretty; we’ve seen a version of this movie before. Zhou Enlai commented to Henry Kissinger in 1971 on the impact of the French Revolution, that it was “too early to say” — the Chinese premier who had been a student in Paris in the early 1920s, was referring to 1968 not 1789. The UK economy in recent times has been a bright star against a dim backdrop and while many of the jobs created are low-paying, part-time and in self-employment, at least jobs are being added. However, observers from the Bank of England to Martin Wolf are puzzled by the fall in productivity. It’s uncertain whether it is temporary or reflects a permanent shift related to the crisis. Martin Wolf has noted that in the fourth quarter of last year, manufacturing was 4.9% smaller than at the pre-crisis peak, while services were 8.1% bigger. Manufacturing though small is important and while the UK is good at science, it’s poor at innovation — like Ireland it’s over-dependent on foreign firms for R&D spending. In 2014 UK GDP per capita at purchasing power parity was 72% of US levels compared with Germany’s 84% and France’s 74%. Ireland was the UK’s fifth biggest export market in 2014, just behind France and 35% ahead of exports to China at rank 6. About half UK trade is with the Euro Area. During the recent election campaign, the Economist Intelligence Unit published a report which says that the UK has fewer doctors, nurses, hospital beds and crucial medical equipment than most other wealthy nations. Overall, the EIU report ranks the UK at just 28th out of 30 OECD countries for healthcare resourcing, whereas it ranks 16th out of 30 on healthcare spending, behind Ireland at 14th. What is unbalanced in the UK economy is the vibrancy of London and the South-east compared with other regions while overall hourly wage costs are just above half of Denmark’s — one of Europe’s wealthiest economies. Recovery yes but lots of challenges too. Our economy and the UK are so intertwined that it’s hard to separate them. If they do well we do well. The one big difference is how the different State’s do governance. The NHS is by and large well run, and the HSE… Why is that? Because of talent basically. You see it in Universities as well – we just don’t have that many talented people at the top of our State organisations. And the politicians are worse – so much so that an intelligent guy like Varadkar stands out a mile. Why is that? I don’t know. Something to do with the monoculture? And the deadening effects of the secondary school machine? Whatever it is, we need to do something about it – we are not letting our very brightest people flourish at the moment. Building land in Dublin now making a handsome 3.5 million per acre. The rent seekers are doing swimmingly, and the objective of this government , and all previous govts, is to keep it that way. The land hoarding and land profiteers never had it so good, with the state in the guise of NAMA with its snout in the pocket of first time buyers and the younger generation, just as much as any buccaneering developer. Those land hoarders should be subjected to CPOs, at agricultural land prices of €15,000 per acre. The housing crisis would be sorted in jig time. Greece and the Eurozone; the immovable object and the irresistible force? Gosh, many comments on here and elsewhere had given me to understand that the moment the celebrity Varoufakis was removed, or even stripped of his offensive leather jacket, Greece was set to float proudly upwards.!! However, I see the real agenda is the imposition of the Thatcherite agenda. “Whether they’re reasonable or not, it’s quite clear that these are pretty Thatcherite policy demands, being asked of the most left-wing government in Europe. Grab your nearest Greek Marxist and ask him or her what they think of these proposals. Whether the agenda is Thatcherite or not is beside the point. This is a knock’em down drag’em out dispute between Tsipras/Varoufakis on the one hand and the EZ (led by Schaeuble) on the other and every card advanced by the former is trumped by the latter. We will default on the IMF! The Greeks paid. We will hold a referendum! Go ahead by all means is the reply and the idea is now just an option. The past weeks show the same pattern. The ECB is caught in the middle. In the meantime, the Greek economy deteriorates. If this is what Varoufakis considers a successful negotiation, one wonders what his idea of an unsuccessful one is. And for a rules based org why doesn’it it have procedures on how to wind down dead banks at least cost to taxpayers ? @JtO: Thanks for the comments. I suppose we will just have to agree to disagree on the actual/possible recoveries of the Irish and UK economies. A drop in productivity? Puzzled they are? Should’ve gone to SpecSavers. They are looking in the wrong direction and the wrong location. But that is what happens when one hangs onto discredited economic ideas. Perhaps they will eventually figure it out. Hint: diminishing returns. Just a gentle reminder about economic Rates-of-Growth: they’re exponential and will definitely inflect over toward zero. 2.5% p/a gives a doubling time of 28 yrs. So, if that RoG remains steady, then the economy will have consumed more in those 28 years than ALL previous doublings combined (say since 1700). You think that is plausible? I know its not. But, Carry On. The article you link to in the Irish Independent is one of the most absurd I’ve ever read. The author accepts that there is a large and growing housing shortage and that the supply of new houses coming on stream is far too low, yet he thinks that there should be no loosening of government regulation and thinks that house prices will somehow level out even without the shortage being reduced. In the real world market forces and the price mechanism always triumph over this sort of socialist claptrap. If there is currently a shortage of houses and far too few are being built, then prices will rise. Period. Morality doesn’t come into it. Whether its unfair on poorer people doesn’t come into it. When supply is too low, prices rise. When supply is too high, prices fall. Period. Look at oil. The only way to minimise future price rises is to boost supply, which will certainly mean loosening of government regulation, amongst other measures. If this is rejected for left-wing ideological reasons, then the resulting price rises will be higher. No amount of socialist claptrap in the Irish Independent can alter this reality. I really think you do you case no good holding up the oil market as the epitome for how free markets work. Not sure what OPEC were up to this last 5 and half decades. You are missing the central tenet of curran’s piece i.e. there is demand but not at any price. When a couple that consistently meets rental payments of 2.5k per month but are turned down a mortgage with 1.8k per month repayment schedule (this is happening today) we clearly have a market that is operating sub-optimally from an effective competition (free market) point of view. The problem lies in access to credit – the couple can’t get their hands on it notwithstanding their ability to pay, developers/REIT investors have no trouble getting their hands on much more notwithstanding a very recent history of inability to pay. The inevitable outcome of this imbalance is abuse of market power on behalf of the buy to let/investor classes. It is the duty of a democratic government to intervene where there is market failure – this is what is at the heart of competition law, it is way the ESB can’t charge what they like, why Irish water can not charge what it likes. The market cannot find its way back to equilibrium when access to credit discriminates against a key investor class (prospective homeowners) in favour of another. In properly functioning free market, the virtues of which you appear to extol, this could not happen….but it is today, it is the duty of government to do something about it because our banking system is currently broken. output per hour worked in the UK economy in q2 14 was 16 per cent lower than if the trend rate of increase from the start of 1999 to the end of 2007 had continued. Wage stagnation and productivity collapse are really dangerous. Housing also reflects income and wealth distribution. Conceptually, people (usually older) with accumulated wealth and savings lend, via the financial system, to those without (usually younger) in order for the latter to buy a home. However, given financial repression, exacerbated by QE, those with wealth and savings are more likely to acquire property themselves, either directly or via borrowing. For example, residential rental yields in Ireland are currently over 5% against a risk free rate of return of 0.65% in the euro area (10 year bund yields) and next to nothing on Irish bank deposits (the interest is also heavily taxed). More supply would help but Ireland has a peculiar system, in that residential housing largely depends on individuals persuading lenders to fund housing developments, as opposed to larger publicly quoted construction companies providing that supply. Developers have also been demonized, some deserving, others not, so its hardly surprising that around half of the limited house building seen of late is accounted for by single houses, presumably built to demand. Site cost = 50% of total house cost. Your solution: Reduce house quality standards and presumably build stacks of butter boxes. That solution would do credit to Ascendancy Ireland, North and South. I’d never have guessed that!! By the way, more than a little hint of growth tapering off. Hopefully not, but keep an beady eye on all April data. You should highlight the full quotation; “it cannot take political decisions which are not within its mandate”. The only body that can demonstrate that it has acted outside its mandate, in any particular case, is the ECJ by way of a negative finding. It has happened, and very recently, and in a most significant case as far as Ireland is concerned. I repeat the relevant link for ease of reference. The agreed outcome is part of the “institutional balance” which has kept the EU together through thick and thin. Opinion is, of course, free but facts, especially of the financial variety, are more difficult; as the Greeks are finding out. @ JtO + Kerchavv: I do not wish to appear impolite about this but… this is what one is led to believe about the residential housing sector when one hangs onto discredited economic ideas. Disbelieving is very hard work! ie: Scarcity/surplus is a reliable price signal: Rubbish -its just a dollop of Psychic Balm for the unthinking. Market Equilibrium: Pure unadulterated economic (theoretical) pap. Dublin residential properties are significantly overvalued – perhaps in the order of 60%: think – mortgage interest rates should be in 6% – 8% range. At presently interest rates have been ‘forced’ lower. Because if they rose residential mortgage defaults would probably rise to close to 50% of loan books -and Negative Equity would abide! @ Seafóid: Thanks. I have this mental image of someones swimming in the nip! Good job the Thames is a tad murky, and all! The number of people in denial of the laws of supply and demand is staggering. Both these inevitably accelerate demand for housing, particularly in Dublin and surrounding area. Unless the supply of housing increases to match it, prices and rents will rise. So far, supply doesn’t seem to be increasing much, a marked contrast with the mid-90s. As for why? I’m not familiar with the situation on the ground in Dublin, but there seem to be an awful lot of these pointy-head environmental wackos in the Dublin area, whose whole lives are devoted to stopping any building and development taking place. They are the ones to blame for rising house prices and rents. During the heyday of FF and the Galway Tent, there was no problem increasing the supply of new houses to match demand, even though the main component of increased demand, population growth, was much higher then. If FG/Lab’s economic performance is as good over the next few years as FF’s was in 1997-2007 (and it might or might not be), and population growth accelerates sharply as a result, any failure to increase the supply of new houses to meet that growth will lead to an explosion in house prices that makes that of 1995-2007 seem small beer. This can still be avoided by increasing housing supply, so what’s stopping it? And what happened the 350k ’empty houses’ that were supposed to exist when FF left office? These could have provided a buffer if they hadn’t been fictional. 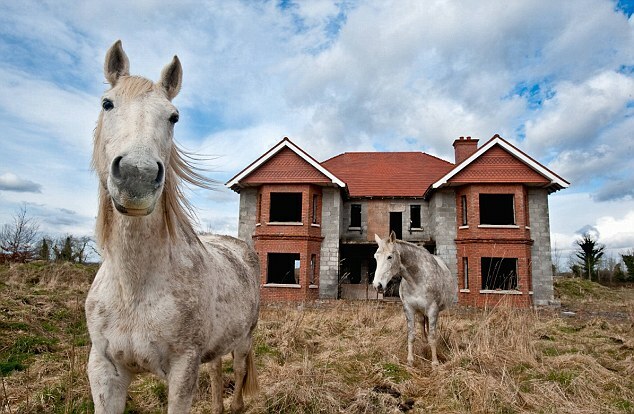 CSO figures show the quality of housing improved dramatically during the Celtic Tiger. CSO quarterly figures on planning permissions show average new house size rising sharply between the mid 80s and 2007. CSO census figures show the number of rooms per person in Irish households almost doubled between 1961 and 2011. Eurostat figures show the number of rooms per person in Irish households the highest in the EU. Eurostat figures show some 97% of Irish households live in houses, rather than apartments. In many EU countries its under 50%. Eurostat figures show ‘severe housing deprivation’ in Ireland the 3rd or 4th lowest in the EU. Am in a rush for work, so apologies for not providing links for these. Can do so tonight if you wish. Although I’m sure a man of your intelligence can easily find them. And the environmental wackos like Frank MacDonald should also lay off attacking people in rural Ireland for building ‘one-off’ houses. Its those that keep rural Ireland alive. When I retire I shall have one built for myself on the Donegal coast. I will give the architect a bonus if An Taisce public condemn it. Seems to be quite difficult to get up to date stats on the number of new housing units commenced. Stats at the dept of the environment and CSO only go up to Feb 2014. The story they tell is an interesting one though. If building continued at the same pace through the rest of 2014 then around 26,000 units might have been commenced, however the pace hopefully accelerated from Feb 2014 onwards. The “problem” with the housing market may simply be that it is volatile and subject to long lags. Some great data out of the UK this week. Employment up, wages up, industrial production up. This boom is getting boomier. I have been studying rural houses recently. One off but systematic OFCH. Poorly insulated. Dependent on a model that drives climate change. Urban housing is not much better. The lansdcape is littered with remnants of previous models that failed. As to culprits, ultimately it will be the central banks which will be branded the culprits because the “collapse” of artificially elevated asset values is still an ominous threat ahead, if not an inevitability. MEE has been espousing this for some time, and many agree (I do). The current status quo is unsustainable in the medium to longer term. Nonetheless, facing into this summer, the big investment money in NY is remaining “unhedged” and so continues to believe that the good times will continue to roll for the foreseeable future (until after the next US Presidential Election is the general timeline /guideline). Yet, on a more individual basis, one sees here that many are trying to downsize from larger houses here in the US NE to more modest ones. Also, for peace of mind over the Summer, some wealthier (but not the mega wealthy) individuals are indeed hedging (floors, collars, etc). As someone senior in the FI world put it to me recently, it’s more like the French preparing to take the Summer off rather than the usual, traditional “trading” US of A. So all this local BS /noise in the Irish property market is likely to be proved to be just that when ultimately the proverbial hits the fan again. However, not in the shorter term…..Some time to go yet. But again, many in Ireland focus far too much on the immediate locality. Yet, the bigger picture certainly says “beware”….Those with short memories may enjoy a “short party”. I should add and state the obvious of course that, with major money players all positioned in the same direction, any major spooking of markets could (again) be disastrous if all head to the exits together. Taking all that into account, it’s truly amazing to see the Irish Govt promote more tax breaks for landlords as its means of addressing shortage of availability of housing….unbelievable when you think about it. Continuing the identity parade of possible culprits, and the reported comment by Schaeuble on the interventions by Osborne in relation to the euro, if Monty Python still existed a skit on the Ministry of Silly Interventions would be on the cards. Curiously, there is has been little or no reaction outside the FT circle to what is hardly a usual event i.e. one finance minister from a major country qualifying the remarks of another in this way. One could speculate that Schaeuble was unwilling to oblige Cameron by becoming Osborne’s opposite number in the UK “negotiations” on staying or going. In other words, the UK will not be allowed to set any agenda for the EU. There is, indeed, a curious similarity in the approach of the new UK government to that of Greece i.e. mistaking a national electoral mandate for an international one. The retro-fitting of the euro continues but a pace, and in a manner, yet to be decided. No, John. Its exactly the inverse. Most folk think that there is actually a law of S/D – and are suckered as a consequence. Its the few informed folk who pay attention to the empirical evidence which shows that there is at best, a flaky relationship between S/D and the supportive assumptions underlying the theoretical model are never encountered in the real economy. Something that could upset your bullish stance on Dublin property. I know you hate anecdotes but it would appear, from talking to those on the ground here Dublin, specifically south Dublin, that property prices are Falling. Particularly at the high end. I heard 10-15% mentioned for some areas from Q4 of last year. Not reflected in the CSO statsbyet. presumably it will feed through though in 3 months or so. It would appear the CB mortgage rules are taking the heat out of the market. The Loan to Income reducing the total amount available to borrow and the loan to value knocking those with out super savings out of the market for a couple of years or so. “But sterling fell back an hour after the unemployment statistics were published due to a downbeat outlook for the British economy by the Bank of England. The Bank governor, Mark Carney, cut this year’s UK growth outlook and warned that productivity, the main impetus behind higher wages, remained weak. The linked table shows the housing cost overburden, measured by income quintile, for the various EU countries. In many cases for the lowest income quintile the housing cost overburden has increased dramatically since the outset of the recession. In the case of Ireland the % of the population paying housing costs in excess of 40% of disposable income has risen from 11% in 2008 to over 19% in 2013. The figures for Greece are 66% (2008) to 95% (2013). On a personal level, I have a near relative living in Dublin, who earns just in excess of the average wage, and spends 40%+ of net income on housing (rent) cost, for what is a poor enough one bedroom apartment. The government solution is make life better for landlords, through bringing back tax incentives. My limited knowledge of Irish history has taught me that there are better and more effective ways to deal with landlords. As of now the number of houses being built is less than the demand for new houses. That’s the fundamental fact. Your solution: let there be a 60% fall in house prices. That would bring average house prices in Ireland down to about 80k euro (55k in £sterling). What is your estimate of (a) the number of new houses that would be built annually in Ireland at those prices (b) the annual demand for new houses in Ireland at those prices. I don’t know (b) but (a) would probably be close to zero. The key point is “couple of years”. Demand currently exceeds supply. If demand is artificially reduced for a couple of years, and people are forced to live in substandard or overcrowded housing or with their parents-in-law for a couple of years longer than they planned, this would have a temporary effect on keeping house prices lower than they would be otherwise, but wouldn’t alter the fundamental demand/supply mismatch, which would resurface even stronger in a couple of years. Even that is assuming buy-to-let investors don’t increase their market share to take advantage of the increased number of renters. The fundamental problem (which Ronan Lyons clearly identifies) is the current mismatch between supply and demand. Regardless of the consensus on here, this mismatch can not be corrected by artificially restricting demand, since people’s desire for high-quality accommodation will grow as the economy grows. The problem with this analysis is that its wrong. The analysis is 100% correct in the context of a normal asset market but the property market is not normal because it is not a market where cash is king but rather its where credit availability is the top dog. Property markets live an die by the availability of credit. So whereas your comments above are correct for oil markets in terms of property when credit availability is high prices go up when the market suffers from a lack of credit prices go down. Period. (In keeping with the tone). I’ve made this basic beyond basic point for a long time here – the early Allsops auctions saw houses in D4 and D6 exhibit falls of c85% from the peak value – primarily because there were cash only buyers in the room – they didn’t require the aid of 3rd party leverage and with not too many other cash buyers around the 85% falls from peak were a predicable outcome. As the banks generally started to dip their toes back into the market prices started to rise in and around April 2013 and what we have seen since is simply more credit being allocated to the market from the banks. People can demand houses until the cows come home but without the appropriate credit being allocated to the market prices will fall to where the cash only buyers are willing to operate. This is an odd market as a result and trying to suggest that house prices can only go one way simply because there is current supply problem is incorrect because it assumes the property markets behave as other asset markets do – we all know to our cost that this is a rather stupid assumption. We saw in the years 2005/2006 for instance that housing supply was outstripping demand by nearly 4 fold on average for the years in question. If we follow your logic then house prices should have been tanking but yet they continued to rise all the way out until July 2007 and only started to move lower as the banking world and their financiers began to take a 2nd look at the asset price risks after the US Sub Prime and Northern Rock issues began to emerge. So in essence the supply demand dynamic had almost nothing to do with pricing for the years above. In this regards the RoI is a great example as to why believing low supply = high prices is simply not a credible methodology to base one’s house price forecasts against. I too can testify that in parts of Dublin house prices are sliding lower as we speak on the back of the CBI credit restrictions. I happen to believe that the views I advance represent the best option for the Greek population. Of course, I may be wrong. But I have no animus one way or the other as far as Greece as a country is concerned, except in relation to the many rent-seeking elements in its economy which have brought it to its present sorry state and for whom I have no time whatsoever, Syriza included. Jobs and pensions in public service and state enterprises cannot be guaranteed on the back of borrowing still more money from unwilling creditors. The fact that it is this unrealistic guarantee that put Syriza into power is not a “mandate” to which anyone need pay attention other than Syriza itself. ‘Twould drive a sane man or woman into Páirtí Cumannach na hÉireann …. the regression to Landlordism continues apace for the humble, and mostly supine, citizen-serfs …. Just to clarify my own view. I do not particularly want to see high house prices. I believe there is currently a mismatch between demand and supply which will put upward pressure on prices. But, I’d like to see this rectified by a massive increase in supply, which would curb this upward pressure. The EU28 average was 33.7%. The fall in Ireland’s figure between 2012 and 2013 is probably due to falling mortgage interest rates. CSO price inflation figures out today show these have fallen again in the past year. So, a good chance Ireland’s figure has fallen even lower since 2013. But, even in 2013 it was the 5th lowest in the EU28. Your argument supposes that, if people have difficulty getting credit to buy a house, they will opt instead to live in a tent. Not so. They will still live in houses. Its just that, if they can’t get credit to purchase a house, they will rent, and some buy-to-let landlord will be the one purchasing the house. CSO price inflation figures out today show rents up over 8% y-o-y and no sign whatever of any slowdown. They’ve been rising at that rate now for about 3 years, at a time when overall inflation is negligible. Buy-to-let landlords must be raking it in at present. Restrictions on crédit don’t fundamentally and permanently alter the supply/demand mismatch, although they might muddy the waters temporarily. Unless there is an unforeseen economic collapse that sends net emigration soaring (always possible but rather unlikely), demand for new housing in Ireland in the next decade and beyond is going to be extremely high. This will come from two sources: (a) population growth (b) falling household size resulting from increasing marriage breakdown levels. In Ireland there are 70k births annually and 28k deaths. Ireland’s surplus of births over deaths is by far the highest in the EU (in almost half the EU countries, there are more deaths than births). During the recession the gap between the two was reduced by net emigration. But, as the economy recovers, based on previous recoveries, there is every reason to believe that net emigration will disappear. In fact, we may well return to net immigration, as ESRI predict. Just on the basis of zero net emigration, that would leave a surplus of births over deaths of approximately 40k annually. So, that’s a population increase of 400k in a decade (assuming zero net emigration). Current house-building rates are nowhere near high enough to cater for the housing needs of such a population increase. As if this wasn’t enough, increasing divorce rates are reducing average household size in Ireland quite rapidly, although it is still well above that of longtime-secularised countries like the UK and the Nordics. As a result, the number of households in Ireland is growing much faster than the population. The number of households increased from 1.0 million in 1991 to 1.65 million in 2011, an increase of 65%, compared with a population increase of around 35%. If, as seems likely, they triumph next Friday, the next great liberal campaign in Ireland will be to make getting a divorce as easy as buying a pizza. Should they eventually succeed in getting Ireland’s divorce rate up to UK and Nordic levels, the number of households will increase by about 20%-25% on top of whatever population growth brings. As I predicted on a different thread a few weeks ago, there is mounting evidence that economic growth in Northern Ireland is falling behind that of the Republic of Ireland and the rest of the so-called U. Kingdom. Unemployment is rising and wage increases are negligible. The main cause is the current very high £sterling exchange rate. This is been driven by the relative strong economic growth in south-east England. But, its having a significantly bad effect on manufacturing, tourism and the retail trade in Northern Ireland. Clearly, although southern England is booming, the UK’s ‘one-size-fits-all’ policy is having a significantly bad effect on peripheral UK regions, of which Northern Ireland is the most peripheral (and the poorest). I wonder of this will receive as much attention from the author of this thread as the alleged bad effect of the Eurozone’s ‘one-size-fits-all’ policy on its periphery. The only way out for Northern Ireland would appear to be the dissolution of the UK. Hopefully, Nicola Sturgeon’s triumph a week ago will bring this about much sooner than was previously expected. We’ll see. The housing market has been so dysfunctional for so long its hard to know what’s the true value of anything is. A lot to do with Russia’s problems I’d say. Though the Finns have a few home grown economic issues to sort out too. Have you considered the possibility that both you and YOB may be right and that your positions can be reconciled? Uncontrolled credit growth bid up the price of houses and put people into nominal ownership of houses that they could not afford. The problem is festering as the political scene in Ireland is such that these houses cannot now easily be returned to their rightful owners i.e. the banks that lent the money to purchase them. Successive governments created the dilemma in which the present one now finds itself. People that could not afford to purchase their own houses should be provided with appropriate social housing but the government can no longer afford to provide this. The only alternative is to try and meet two conflicting demands at the same time (i) avoid repeating the supervisory error with regard to the banks (i.e. stricter LTV and LTI limits policed by a Central Bank that now has some teeth; but which the IMF fears may be extracted) and (ii) indulge in the pretence of increasing the availability of social housing but, in reality, being entirely dependent on a privately-owned rental sector to meet demand from those who cannot meet the new loan standards and those who could never meet them in the first place and trying to avoid bidding up rents in the process through increasing rent supplements for the latter. Result; little or no incentive for new construction other than one-off housing largely based on local considerations (e.g.availability of sites to children of farmers) and cash. In short, it is both a problem of availability of credit and supply and demand and of a policy failure to reconcile the two. A failure that stems from a national obsession with property and a belief in it as an investment – or a pension – rather than a living expense that should be kept as low as possible. The one economy that has not made this error is Germany. the chance of either the markets or the CBs making a wrong move and toppling the house of cards over must be high. I see Goldman Sachs still use VaR to manage risk. That’s not particularly encouraging. Same crap modelling as in the run up to Lehman. It gives me no pleasure to see the Finnish economy struggle. Finland achieves excellent results in global education tests (usually the best in Europe), so it has a good foundation for growth in the future. it needs to detach itself from the ideology of big-government, high taxation loopy-liberalism and political correctness that it has imported from neighbouring Sweden. I know nothing about Finnish politics, but I read a few weeks ago that the new government is mainly rural-based, with quite a strong religious streak, and that the new Prime Minister is a practising Lutheran, so there is hope that Finland will become less Nordic and more like Ireland in coming years. On the plus side this would result in its developing a vibrant flexible growth economy. On the negative side this would result in a marked reduction in the number of times it is held up in Irish Times articles as a model of all that is good and holy. You can’t win them all. The “true and fair” over-ride. It is no harm at all to give that a table a little airing. The table itself, for the lowest income quintile, should be renamed the ‘European Table of Shame’. That Ireland is the fifth least worst in the table, and rapidly descending to the middle of the shameful pack, is cold comfort to those affected. While Ireland’s figure is currently 19%, I am in no doubt that the figures for Dublin tenants, ~33% of all Dublin households, are well above the EU average, a shameful average in itself. The table itself speaks volumes for all that is wrong in Europe today. The figures for Greece if correct, which I doubt, auger very badly for that society. 2629 Irish housing units completed in q1 according to DOE, up 25.6% yoy. 652 in Dublin city and county (less than 25% of total) of which 204 apartments. “Housing costs…a living expense that should be kept as low as possible. The one economy that has not made this error is Germany. Would you care to supply evidence or a link to evidence to support this statement? As the police here say: “You are not obliged to do so, but failure to do so will be taken into account when the jury is reaching a verdict on which of us is right”. Ireland was the 3rd lowest in Europe for housing costs. Germany the 3rd highest. Apologies for destroying your argument so comprehensively. Not a nice thing to do on a Friday evening, I know. I can think of 3 reasons why Ireland has had such low housing costs. (1) Apart from a brief period 2004-2007 house prices in Ireland have been lower than most other countries of comparable wealth. Currently, they are only about 50%-60% of UK levels. House prices in rural Ireland are currently among the lowest in Western Europe, Dublin is more expensive, but not expensive in comparison with other capital cities in Western Europe. (2) Home ownership has historically been higher in Ireland. This results in a large section of the population, especially those over 50, having zero housing costs once they pay off their mortgage. I am one of them (although technically not resident in Ireland but in the UK). I have no housing costs. My mortgage is paid. Neither did my parents for the last 35 years of their lives. This is much better than renting, where I'd be paying rent up to age 120, if I live that long. (3) Property taxes have historically been low in Ireland. (4) Divorce rates have historically been very low in Ireland. The result is that there are far fewer single-person households in older age-groups in Ireland than in other European countries. Divorce doubles housing costs at a stroke. Obviously, this may change in Ireland in coming decades as liberalism tightens its grip. High divorce rates may be very bad for society, but they are wonderful for the house-building industry and estate agents. "Have you considered the possibility that both you and YOB may be right?". Just as there is a difference between 'climate' and 'weather', there is a difference between long-term housing demand in Ireland due to the factors I mentioned, population growth and increasing divorce rates resulting in falling household size, and short-term effects due to government restrictions on credit. The latter can affect house prices in the short run, but long-term the growing number of households will still require to be housed, and whether this is achieved by increased renting or by government intervention to build houses, the result will be the same: namely, there will have to be a dramatic increase in house-building rates to meet the growing demand, and until such time as this is done (however it is done), there will be severe upward pressure on prices. Ironically, if the government wanted to reduce upward pressure on house prices, taking steps to reduce the divorce rate would be far more effective in the long-run than putting curbs on credit. We know from yesterday's events that the FG/Lab government have no interest in doing this. Increasing divorce as factor in house price rises in Ireland since the mid-90s has been largely ignored by the media, although I think Alan Ahearne brought it up last year. The most important line in your entire argument is based on the assumption ‘that buy to let landlords will be the one purchasing the house’. Perhaps I missed something over the past 7 years but are buy to let landlords almost as toxic as Sean Dunne in the banking circles ? They currently have the highest level of non-performing loans in every bank book within the island and your assumption is that the same banks will joyfully hand over truck loads more of cash to the same dudes that can’t afford to repay a quarter of what the currently have outstanding. Dream on. You also assume therefore that a new cohort of buy to let landlords are chomping at the bit the get in on the action. I wish you the very best of luck with that business plan when you next step into your local AIB. The banks are back lending to house buying customers, this is undoubtedly true, but the lending is piecemeal, slow and deliberately detailed – all good in my book – but it is not the type of environment that a wannabe larger scale buy to let investor is going to find much traction unless their overly endowed with equity, which lets face it, the overwhelming majority of the public are not. What this tells us is that house prices will follow the growth in rents but there is a limit on this growth and that limit which was mentioned above is probably very close to being reached – there comes a point when paying the rent rather than feeding oneself seems a really bad bet. That point has been reached in some parts in Dublin and the rent growth from here will be negligible and as a consequence so too will house prices. Those who want to avoid urban camping will move to the towns and villages around Dublin and this is why rents in those areas are rising faster as a result. Rental yields moving to less than 1% as they did in D4/D6 in 2006/07, is highly unlikely with credit still in short supply. But most of us know that this 2006/07 rental yield aberration was almost entirely driven by the denominator effect and not by a falling top line. What we have now is a growing top line but a slow if not stagnant bottom line, particularly in Dublin and this is why despite all the talk of new housing bubbles and the lack of supply etc that the yields in the Dublin area are on average about 6.5% per the latest Daft.ie survey. If one believes there is still some upward pressure on rents then yields will possibly go to about 7% as house prices will most likely flat line from here. 7% yields suggest fair value in housing. There are parts of the Irish housing market where we still have to travel some distance to achieve that level – rest assured it will happen as it is currently happening in Dublin, as yours truly predicated back in 2008. Bottom line in housing – the banks ultimately determine if pricing is fair or not. They got their calculations badly wrong in the years 2001 to 2008. The last 7 years has seen fair value almost restored. It seems unlikely to me that the banks will allow the property market to go pop so soon after the last party. an engineer, lutheran and self made millionaire. Seems like a real get things done kind of a guy. I wish him well. You are missing the point that I am trying to make. It is not the percentage of income devoted to housing, whether rented or owned, but the availability and reliable cost of the latter over time that matters both from the point of view of the individual and the management of the economy as a whole. Germany comes out miles ahead on these scores. It has not had a boom and bust housing cycle (unlike its close neighbours, the Netherlands and Denmark, with a bust now also looming in Sweden). The statistics that you quote are also very much open to question as one would have to look at the other elements in the expenditure patterns of the individuals in the various countries concerned to come to any reliable conclusion. Housing is certainly cheap for some in Ireland, especially for the older generations that have benefited from the boom and bust cycle. Indeed, many have been through several of them and have come out ahead. But not the most recent generation, many stuck in negative equity or with tracker mortgages that tie them to unsuitable apartments and houses. This is, indeed, part of the experience of many reading this blog. Practically the only other European country that manages to emulate the performance of Germany is Belgium which also has a tightly regulated and well-run housing rental sector. “Revenues, meanwhile, were lacklustre in the first quarter and are expected to deteriorate in the second, with estimates compiled by FactSet pointing to a 4.7 per cent year-on-year decline in S&P 500 sales. But who cares with PER the main metric ? Read all about it! The risks to the nation, in 2015, that is. Unfortunately, the draft report does not cover the biggest risk; the desire of politicians to get re-elected, irrespective of the risks contained in the promise they feel compelled to make to the electorate. The same conundrum as is now presented to Syriza. “It is no harm at all to give that a table a little airing. The table itself, for the lowest income quintile, should be renamed the ‘European Table of Shame’. In Northern Ireland we use words more sparingly. We call ‘least worst’ by the shorter term ‘best’. It saves a word. I don’t recall the Irish rugby team being described as the ‘least worst’ in the Six Nations back in March. (a) claims about the unaffordability of housing in Ireland at the peak of the Celtic Tiger were greatly exaggerated. In 2005, 2006, 2007, 2008 housing costs for the first quintile in Ireland were the lowest in the EU, apart from tiny Cyprus and Malta. Incidentally, the very low housing costs in Cyprus Malta, both traditional countries, are probably at least partly due to one of the reasons I gave in my earlier post (namely, low incidence of divorce). So, the government seems to be in agreement with what I said in my earlier posts. Just to clarify again. I am not arguing for high house prices. I’m saying they are a consequence of not building enough houses to meet demand. By far the best solution would be to build sufficient houses to keep up with demand. Demand itself is a function of the rate of new household formation. Ireland had a very high rate of new household formation between 1991 and 2011 (up by around 65%). The rate of new household formation is likely to have fallen considerably during the recession, but is likely to be rising again now that the recession is over. That’s probably the reason for the rebound in house prices since early 2013. I am late to this thread as I’ve been busy at night rehearsing for a local fundraising song and dance event in June. What entertainment I’ve been missing! You must promise to make yourself known to me should we ever end up in the same room. That will be my pleasure. Come to the Tyrone victory dinner in Dublin on the night of the All-Ireland final, and I’m sure to be there. Figures out today show the number of mortgages taken out in Q1 2015 was up 65 per cent on Q1 2014. But, I take the point you will undoubtedly make that this may have been partly caused by a rush to beat the deadline for the new Central Bank restrictions on mortgage lending. Still, I’m surprised the increase was so large given that the deadline was in February (I think). We’ll have to see what happens in Q2. Further illustration of the path to totalitarianism, down which left-wing ideological politics is driving large parts of the western world. Copenhagen’s loony-left Mayor is banning all city council employees from flying Ryanair. Apparently, Ryanair doesn’t meet the utopian level of employment conditions that his politics require. Imagine the outcry if Boris Johnson did this. I don’t know if this is legal under EU law. The Irish government should take action immediately. I won’t be be eating any Danish pastry until the ban is lifted. Boasting best in a league of laggards is a poor boast indeed. I will stick to my definition of least worst for that particular table. I note you have commented on the housing overburden rate for Dublin tenants. I would be interested if you would use your statistical expertise to derive same. My own hunch is that the housing overburden rate for Dublin tenants is now well in excess of 40%. Landlord dominated Ireland is back with a bang.